Have you ever found you didn’t have matching ribbon? Well, you can color your ribbon with the color you need. You will need Stampin’ Up! White Organza ribbon #114319. Watch the video to see how simple it is to do. I want to a Christmas card with Baby Bear, but I reframed. We still need to do Halloween and I have an idea for it. So I did a baby card. However, change the greeting and you could have a Christmas card. What do you think? My mother always had bears on her bed at Christmastime that she called Christmas Bears. Remember this is either a three step process or a two step process. Mine a two step this time. Do you know someone that needs cheery thoughts? These little birds are tweeting thoughts your way. This card has a little touch of fall with the Cajun Craze leaves on the tree. 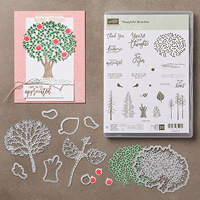 If you haven’t order your Thoughtful Branches and the Beautiful Branches Thinlits, you are missing out on a very special set. This stamp will be one you reach for because of the versatility. It will work for all seasons and not just trees. You will create a beautiful Hydreanga from the set. However, you need to order this in August because it will be unavailable next month. If you don’t have a demonstrator, I would be happy to order this set for you. I have posted another card on my Facebook page. So when done here, click here to go to the Stampin Pink Rose Facebook.